Pypes Street Pro Dual Exhaust Black Tip 06-14 Dodge Charger SRT8 11-14 Dodge Charger 6.4L Pypes Street Pro Dual Black Tips Exhaust Kit, 06-10 Dodge Charger 6.1L Pypes Street Pro Dual Black Tips Exhaust Kit, 11-14 Dodge Charger 6.4L Exhaust System, 06-10 Dodge Charger 6.1L Exhaust System, Dodge Charger Pypes Exhaust, [Pypes SMC11SB Exhaust Kit] - $619.95 : 3rd Strike Performance, Your Source for Late Model MOPAR Performance Parts and Accessories! Pypes Street Pro exhaust systems are designed to boost your car's performance to the next level—you'll get more power, better mileage, and a rich, throaty tone that can't be ignored. Built to outflow and outlast factory exhausts, these systems feature mandrel-bent, 16-gauge, stainless steel pipe and precision-matched stainless steel mufflers. Don't let the looks of these mufflers fool you. Although at idle, you may cause passengers to reach for their seat belts—upon acceleration, a smooth, authoritative tone turns apprehension into a reassuring confidence. These great street/strip mufflers will maintain their rich sound qualities for life because there is no filler to burn off. They're recommended for stock to medium-modified vehicles where an aggressive sound is appreciated but not advertised. 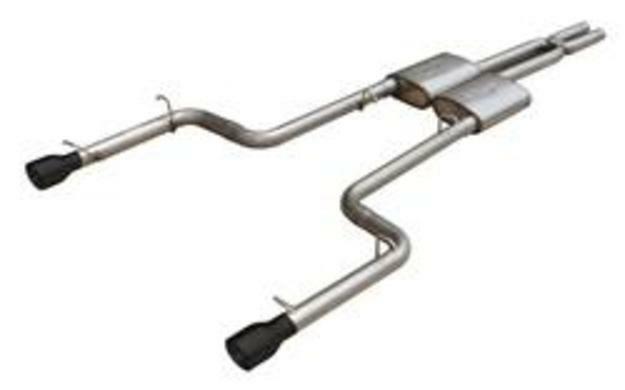 Pypes Street Pro exhaust systems include stainless steel hangers, clamps, and instructions; their slip-fit connections facilitate a fast and trouble-free installation (some cutting may be required).